Please read through these most commonly asked questions about Elite BJJ Events competitions and BJJ competitions in general. If you do not find your answer here please feel free to email us. If my child loses the first fight will they fight again? We operate a straight knock out format similar to the IBJJF. If your child loses the first fight they will not fight again. What time does my bracket/fight start? A full schedule will be published a few days after the final check date once registration has closed. Please bear in mind that the published bracket start time does not indicate your fight start time. Larger brackets take longer to run so you fight time may be after the bracket start time. We aim to start all fight as close to the bracket start time as possible. What time to I need to warm up? Everyone is different when it comes to warming up but we recommend you warm up at least 30mins prior to your fight. Have I won a medal? After your fight, it’s best to ask the Runner/Mat organiser if you have any more fights or have medaled in your Category. When do I collect my medal? After your last fight, your Runner/Bracket Supervisor will advise you if you have medalled or not. If you have won a medal please listen out for your category and name to be called by the podium staff. We aim to give out medals as soon as all of the results have been recorded in the system this can take up to an hour. 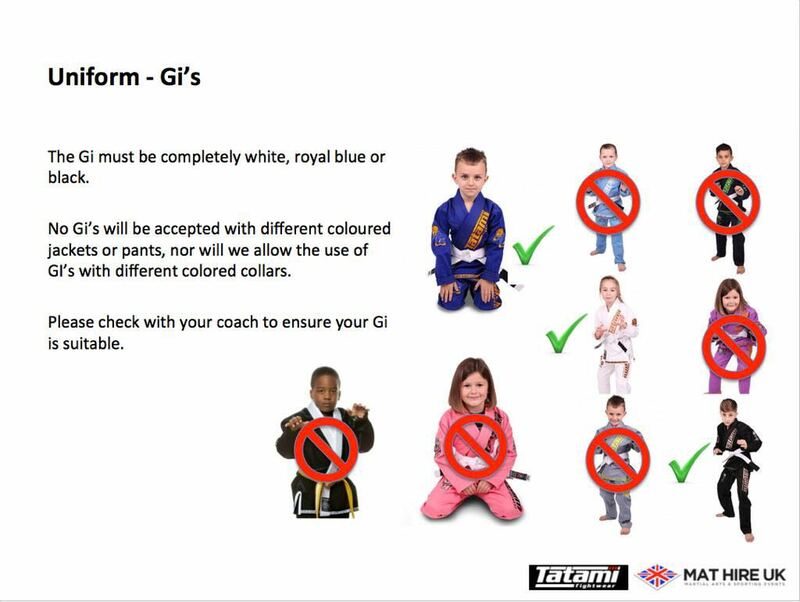 What colour GI can my child wear?